October 2, 2014 — It can be argued, and I usually do, that the best part of my books are their covers. 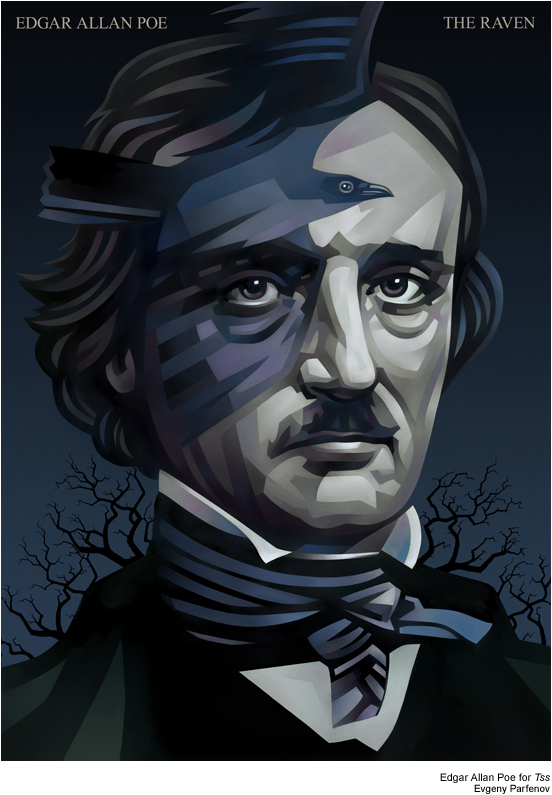 The same artist, Brian Weaver, whom I brought with me to the publisher, has done all three of them—The New England Grimpendium, The New York Grimpendium, and Poe-Land: The Hallowed Haunts of Edgar Allan Poe. I’ve already talked about the inspiration behind the Poe-Land cover, the poster from the 1983 movie Something Wicked This Way Comes, based on the book by Ray Bradbury. 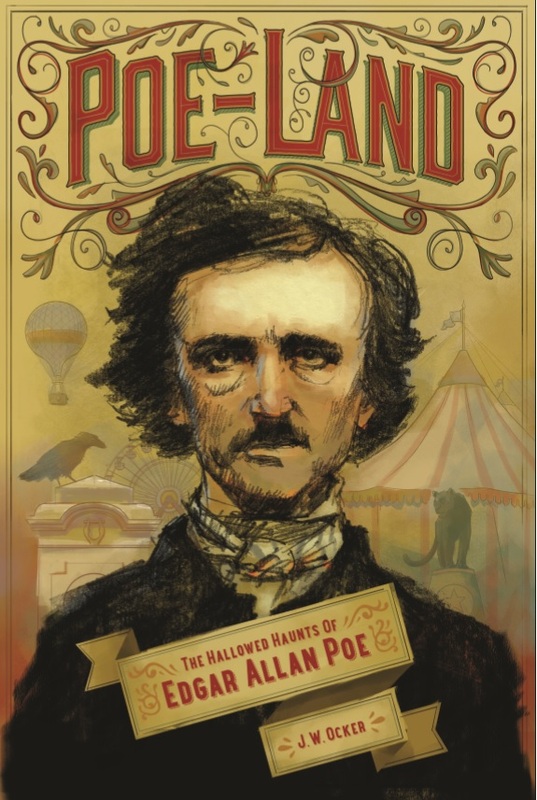 I loved the idea that Poe-Land was a mad carnival full of Poe sites and artifacts that transforms all who enter. But I didn’t tell you how we got there. It took us a bit. Most of the process, though, was in the discussion phase, where we needed to come up with a new way to depict Poe that accessed everything I love about Poe imagery without being cliché (as there are 8.3 million depictions of Poe out there). To put the paradox in a different way, I love that Poe’s familiar is a raven, and I’m tired of Poe’s familiar being a raven. 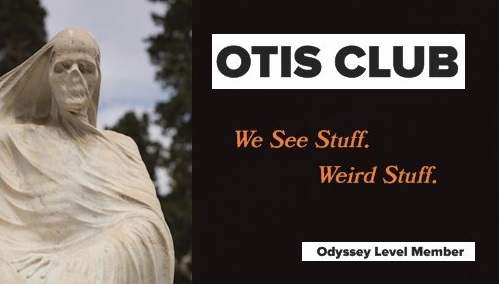 Also, we had to avoid the book being mistaken for a collection of his stories…although that would probably make it sell better. 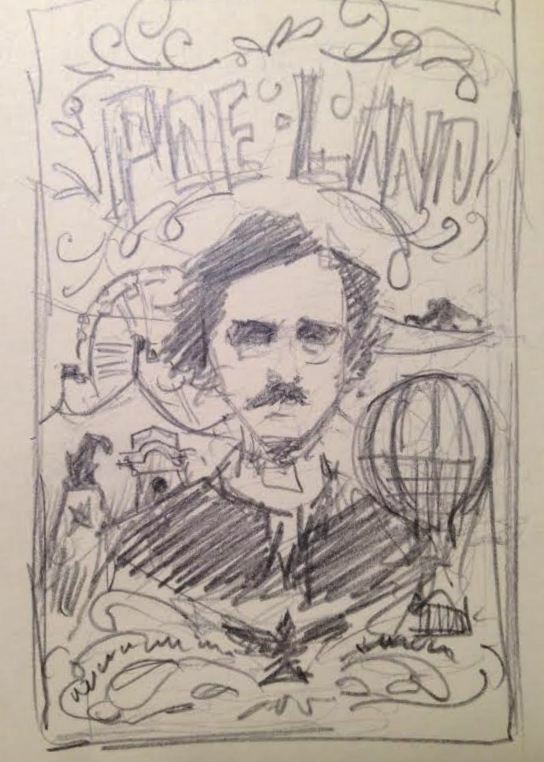 First, though, there was the matter of Edgar Allan Poe himself, and when I saw Brian’s very first sketch of the poet, I knew the cover would be awesome. Then we came up with a bunch of ideas for the cover. A couple of them I still really dig in concept, but when Brian started sketching the ideas out, it was pretty obvious the one we both were falling in love with. So let’s talk about three that we almost took down the aisle. This idea was a take-off of Antoine de Saint-Exupéry’s The Little Prince. I loved this idea because it showed Poe as somewhat pathetic and sad, but still a man who owned a world. One of the striking points about Poe is the cosmic joke of a contrast between how he was held in life and how he is held in legacy. And I feel like this simple image stolen from a French children’s book really illustrated that idea well. 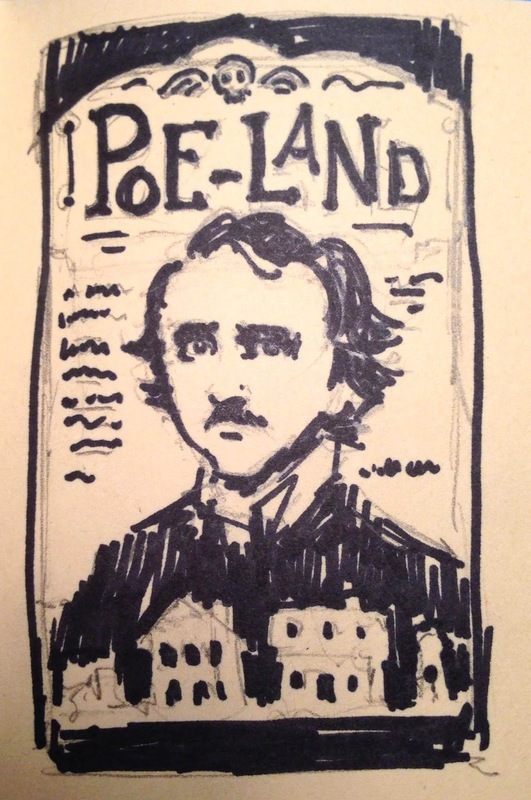 This idea is straightforward and involved depicting actual sites in Poe-Land on the cover. This avenue had to be explored, and while this would’ve made a fine cover (and I love the tombstone sky), it just wasn’t different enough for this oddity of a book. A third idea that we didn’t even try to sketch because I went way overboard with it really fast just describing it was to make Poe-Land like Disneyland, but instead of Walt Disney holding Mickey’s hand in front of Cinderella’s Castle while Tinkerbell flew over it, it would be Poe holding the hand of an orangutan in front of the House of Usher while a raven arced over. As much as I really wanted an orangutan on the cover, the idea was too over-the-top and relegated the image of Poe’s countenance into too minor a part of the composition. More importantly, it was too much of a pop-culture mash-up for my taste…which in today’s Internet world meant it was probably the right way to go. Once we had arrived at the Poe-Land as a Carnival idea, there was still the matter of figuring out what was going on the cover and its arrangement. That just took me listing things and Brian doing the things that artists do. But the last big decision, and this will be the one that everybody reading this will disagree with me over, was the color of the cover. I wanted it like a carnival poster, which meant the yellowish color it ended up being. But another option was to bring it even closer to the Something Wicked This Way Comes poster by making it a night carnival scene. 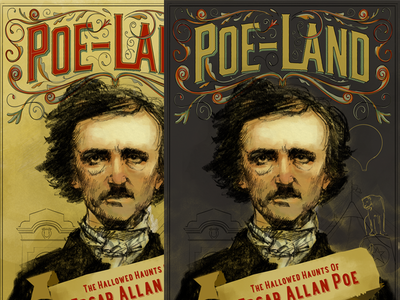 But the problem to me was that Brian and I weren’t in control of the printing process, and the darkness of Poe’s hair and clothes, if not printed with the exact right contrast, would blend too much into the night time of the cover. Also, a dark Poe cover was just too Poe cliché (albeit a Poe cliché that I love), and we wanted something different. And I think that’s what we got. Anyway, that’s my take on it all. I sent Brian a few questions to answer, as well. 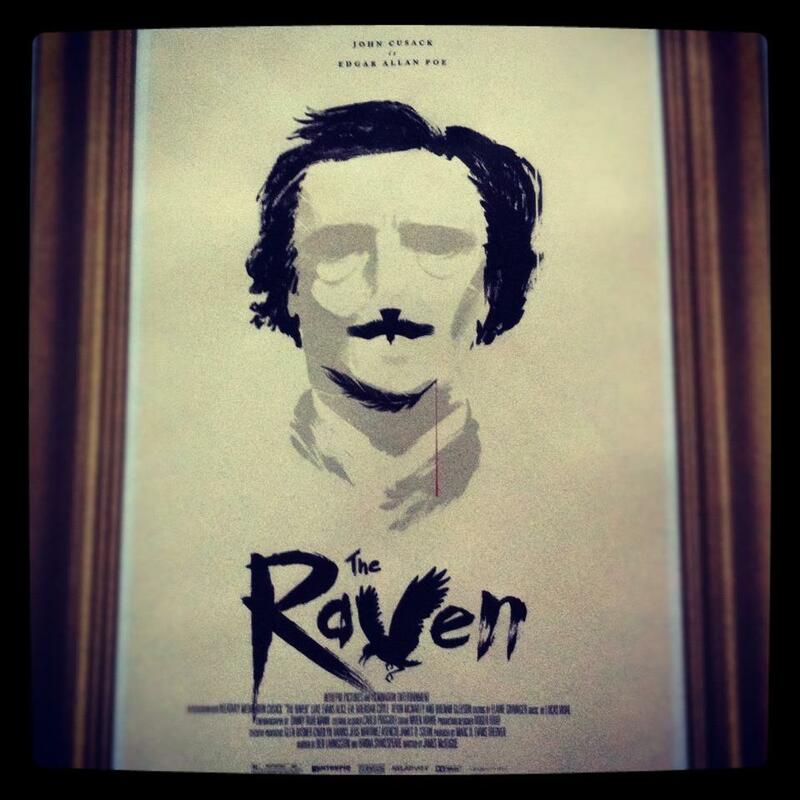 Did you find it easy or hard depicting Poe? In one way, it was easy, because Poe has such a recognizable face, so as long as I nailed the huge forehead and moustache. 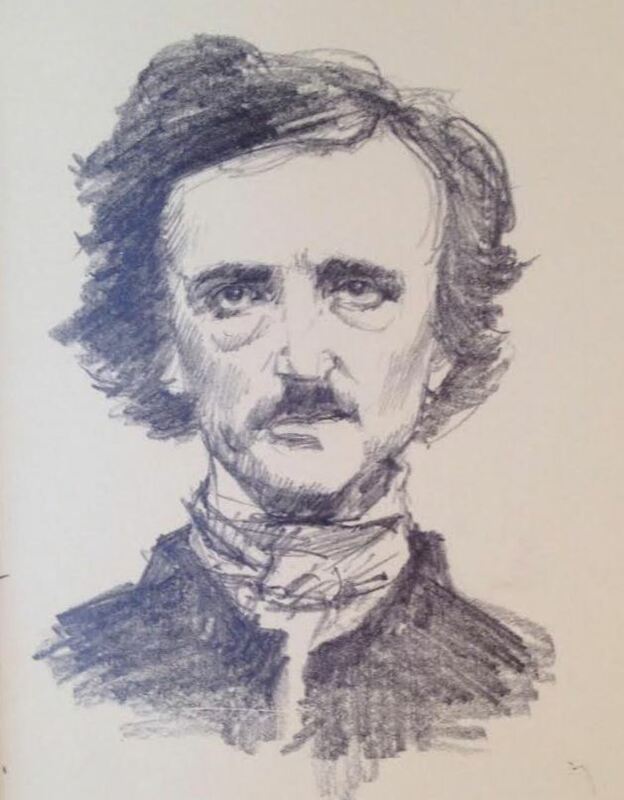 But I also wanted to depict him a little differently than all the other depictions of Poe, which was a challenge. He's often depicted as troubled or tortured, and, hopefully, I captured something of his troubled, melancholy soul in the expression on his face. Beyond that, though, I tried to make him look like a real guy, not a caricature. So there's a bit more in his expression than just sorrow, there's a little arrogance maybe. And resignation to his fate. Was there any Poe imagery you relied on more than others as a reference? 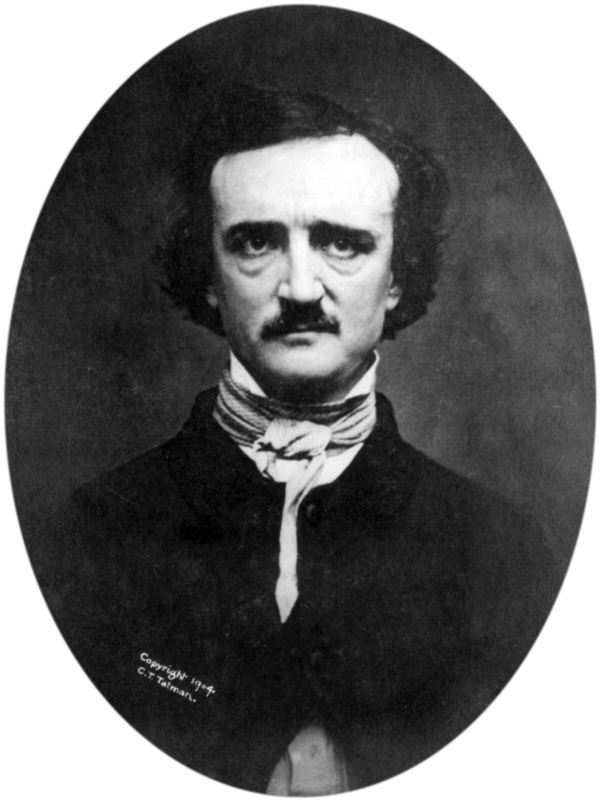 The 1848 “Ultima Thule” daguerreotype of Poe is what I referenced the most. It would have been interesting to have seen him in real life, to observe his mannerisms, to notice how he carried himself, to see his different emotions. Because all we have are pictures, our depictions of Poe can only be an interpretation of those images without really knowing if we've captured Poe himself. What in general struck you by all the ways people depicted Poe online and anywhere else you looked? 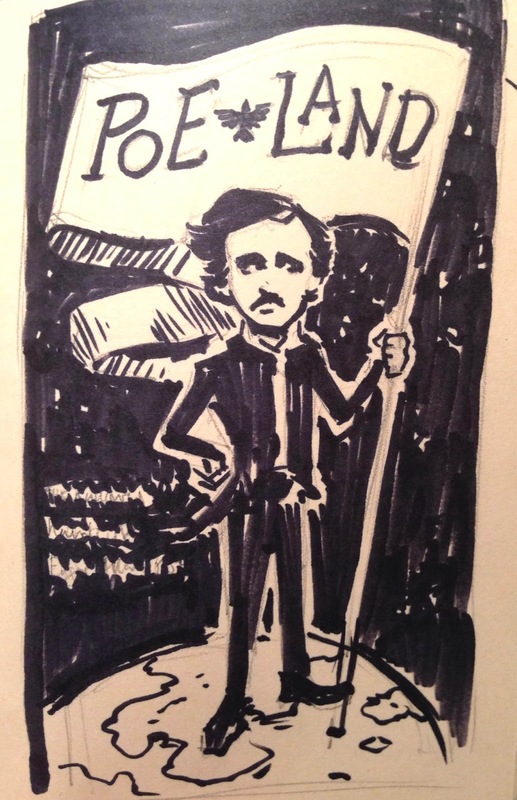 There's a lot of terrible Poe art out there, from a technical standpoint. And, conceptually, I noticed a lot of the same ideas rehashed over and over. I think it's natural to go to the stereotypes, y'know, with his hair turning into ravens, or black cats, or both. I remember when we were talking about the cover, that we wanted to avoid those clichés. We did toy around with using an orangutan because it's such a rarely used icon in Poe art, and we thought we could do something unique with it. But in the end it didn't make it into the cover. Were there any depictions of Poe that you found particularly astounding? This one by Olly Moss is amazing. Concept and execution are both spot on. Also, this one by Evgeny Parfenov, which I think you showed me. It's technically well-done, and a unique spin on the raven concept. What was your thinking behind depicting Poe in an unfinished style and the background in a more finished style? That's one thing that I wasn't sure about with this cover. I had thought about going back and redoing Poe so that there wasn't a discord between the roughness of Poe's hair and clothes and the smoothness of the background. But, in the end, I kind of like that Poe feels a little unkempt and transient. How familiar with Poe were you before this project? I was familiar with his more well-known works, but not so much with Poe himself. So I've read several of his popular short stories. The first Poe story I ever read was The Tell-Tale Heart. I read it in junior high in literature class. That story genuinely freaked me out. After that, I think The Cask of Amontillado, which is one of my favorites. I also like The Purloined Letter, probably because it was the precursor to the Sherlock Holmes stories, of which I'm a huge fan. Basically, what I knew of Poe, I knew through his work. How did you arrive at the carnival calligraphy? I looked at a lot of old carnival posters, circus posters, carnival signs, playbills from the early 1900s. I tried a couple different approaches based on the lettering from that source material, but they didn't feel quite right. So then I looked at the carving and lettering on circus wagons with all the flourishes and intricate detail work. That's where I drew inspiration from the most. As far as I know, you’re not a morbid guy like me, so what’s it like having to become one to create skulls and grim reapers and Edgar Allan Poe for my books? Haha, I once was a morbid guy. I used to read a lot of Lovecraft, but I've since moved away from the darker corners of the library. I guess I have a small touch of morbidity still in me. I like to visit old graveyards. I get nostalgic for the Halloweens of my childhood on windy, October nights. But that's about as far as it goes. Working on your book covers has been actually pretty cool, though. Out of all three covers, this one was my favorite to work on. Here’s a link to see more of Brian’s work. Or buy Poe-Land and own some of Brian’s work. And mine. It's the less-pretty black and white bits in between.